It is easy to view Kiki Bertens’ loss on Saturday at the U.S. Open as a crushing disappointment. Bertens had a draw which was favorable. She faced Marketa Vondrousova, a talented but inexperienced 19-year-old who had done very little on tour this year. Vondrousova had not won more than one main-draw match at a non-International tournament since Indian Wells back in March. Premiers, Premier 5s, Premier Mandatories, majors — Vondrousova couldn’t get momentum or traction. This was not an in-form player, and not someone with regular match rhythm. Given that Bertens had rolled through each of the first two rounds in New York, this result could be seen as a devastating disappointment and an abruptly early departure for the Dutchwoman, who had won her first Premier 5 title in Cincinnati weeks ago. To be sure, this is a missed opportunity. Lesia Tsurenko, a fine player but not a titan of the women’s game, awaited in the round of 16. Bertens would have loved that matchup. She had a great chance to reach the semifinals and pick up a large collection of points to boost her ranking for 2019. Losing to Vondrousova won’t immediately be shrugged off — a part of this result will linger. Yet, the idea of a “bad loss” — something unacceptable or unforgivable — is excessive as a characterization of this result. A “bad loss” conveys the image of a dark cloud, a low point, a crisis, a gut punch that isn’t easily recovered from. This loss does not meet those descriptions. Unconvinced? I could readily understand why… so I will explain. One notion I like to emphasize in tennis — and for that matter, all sports — is the idea that athletes can’t act like they’ve been there before if they HAVEN’T been there before. Athletes have to taste and absorb the full reality and sensation of graduating to a higher level in tennis. Reaching that higher level, breathing that thinner air, isn’t instinctively or naturally done on a first try — not normally. Boris Becker or Michael Chang winning majors at 17 years of age are aberrations, not routine occurrences. Even for someone such as Bertens, at age 26, digesting and absorbing one’s newfound status as a Premier 5 champion, and as a higher-level threat to the other players in the locker room, is a layered and complicated journey. This process involves becoming a target, someone everyone wants to beat a little bit more. Bertens played a lot of tennis in August and, on the first day of September, had to take the court on the best sustained run of her career. Her resume had been bereft of any meaningful achievements on non-clay surfaces. She thrived at Wimbledon, did well in Montreal, and was special in Cincinnati. Moreover, before her summer explosion began, she reached the Madrid final. It has been a superb stretch of four months for Bertens, riding the wave at a level which was unprecedented in her professional life. Riding this wave involves the reality that at some point, a match won’t go smoothly. Tipping-point moments won’t tip in the right direction. Only the giants of tennis — Martina Navratilova losing a combined three matches in 1983 and 1984, or John McEnroe going 82-3 in 1984, or Roger Federer going 92-5 in 2006, or Novak Djokovic going 82-6 in 2015 — can go through full seasons with barely any setbacks. For Bertens and most of the tennis tours, losses are a part of life. Simona Halep is the best WTA player in the world, and she has lost nine times entering September. Losses will come — the challenge for elite pros is to not suffer too many too early in important tournaments, and within that goal, to reach peak form at the majors. Bertens, who delivered her best Wimbledon showing in July, was hoping to craft her best career outing at the U.S. Open. It didn’t happen, and that’s why Saturday’s loss should sting to a certain degree, but Bertens was walking into new territory in New York at this tournament. She came to the Big Apple under a new set of circumstances. A day when her form lost its convincing consistency didn’t go her way. Her opponent had a lot to do with it, but tiebreakers — which Bertens lost in the first and third sets against Vondrousova — are crapshoots. It seems markedly unfair to turn this match into a verdict on Bertens. It is more a product of some very organic tennis realities which caught up with Bertens in the wrong place at the wrong time. Far better to suffer a “law of averages” defeat in Wuhan than at the U.S. Open, right? This tournament just didn’t work out in the manner Bertens had hoped it would. Now, though, Bertens has a much better understanding of what it means to reach a higher level of stature, and of what it means to play larger collections of tennis matches (since that is what the best players do, going deeper into important tournaments). Bertens succeeded in carrying her Wimbledon level of form to summer hardcourts. She displayed fitness and stamina, shotmaking quality and resilience over the past two months. She has noticeably improved the trajectory of her career. She can be given a pass for New York. The future, though — particularly an important 2019 season — will represent a strong and meaningful test of how much Bertens has improved. 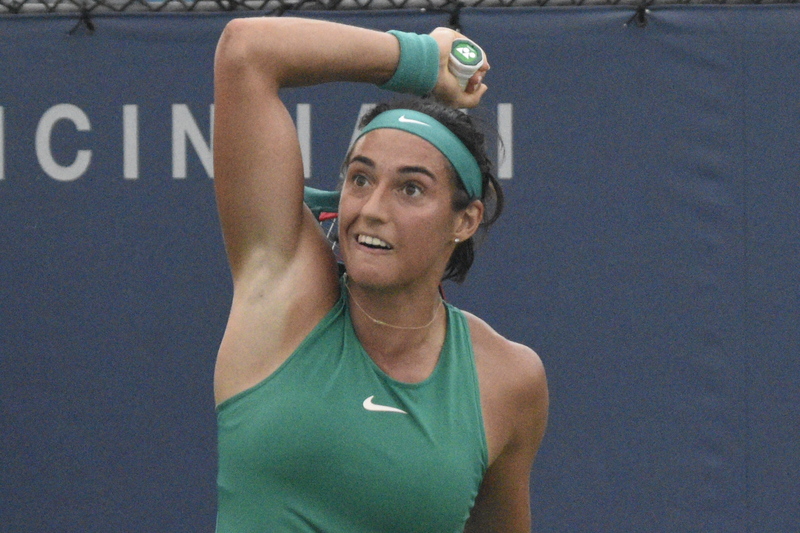 To understand this, consider life from the perspective of another WTA player who entered 2018 the way Bertens will enter 2019: Caroline Garcia. Late in 2017, Garcia made what was her best career run. Over the course of an exceptionally good month in autumn, she won Wuhan and Beijing before making the WTA Finals semifinal round. This wasn’t a full season, but it was more than just one tournament. Garcia showed she could back up a few results and carry momentum from one city to the next. As 2018 began, though, Garcia faced the challenge of turning that brilliant autumn swing into a full season of quality. She had announced her presence; could she then maintain that presence? Garcia lost on Saturday, alongside Bertens, at the U.S. Open. She also — like Bertens — lost a final-set tiebreaker. Garcia fell to Carla Suarez-Navarro. CSN is a quality player, but in the same breath, not a top-10 heavyweight who exists on the same plane as the biggest championship threats on tour. Garcia never did get past the round of 16 at any of the four majors this season. She wasn’t terrible — the bottom hasn’t fallen out from under her — but she has not elevated her place in the sport, and with all these upcoming autumn points to defend, a rankings tumble is likely to occur before the end of the season. Garcia had a chance to spend the offseason in November and December of 2017 preparing for the storms that were to come in 2018. Garcia hasn’t handled them well. Her losses carry more of a sense of disappointment than what Bertens endured this weekend. The new path for Bertens is to process this day against Vondrousova and — when walking through the experience of handling a difficult match as a high-mileage player this summer — understand what adjustments she can make the next time she encounters such a situation. 2019 will be the measure of Bertens’ attempt to climb the ladder on the WTA Tour. One U.S. Open loss won’t dim her 2018 season in a meaningful way. This is a time to learn from a new experience, as all human beings must. Next time — when the sensation of riding a wave is no longer new — Kiki Bertens can expect more of herself… and then reach her fullest potential.